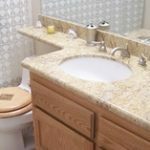 American Stone Edge installs granite, marble, quartz, travertine, and limestone vanities, floors, wall cladding, showers, and more. 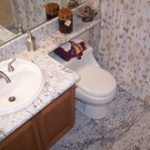 While granite is the most common choice for vanities, marble is also popular because you typically don’t have to worry too much about food or drink stains in the bathroom. 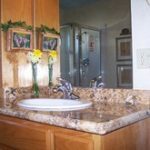 The bathroom vanity installation process begins when you call us with your countertop dimensions to get a quote. Then we visit one of our vendors and help you select a slab you love. Once we begin working on a vanity installation the process usually takes 3 to 4 days. Quartz is a durable and nonporous option that’s easy to clean, doesn’t require sealing, and will not stain. Travertine is especially popular for wall cladding, floors, and showers because it is very strong and heat resistant. It is frequently installed in tiles for wall cladding and floors. 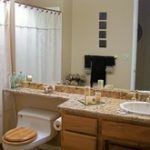 We provide free quotes to clients who provide us with information including stone type, square footage, and whether they need an over mount of an under mount. Another thing we need to know before we cut your slab is how many sides of the surface are going to be exposed once installed.